The Future Of Publishing (2): One iPad to rule them all? As magazine publishers are looking for ways to survive the digital revolution, there is one knight in shining armor – the iPad. At VDZ’s Digital innovator summit, the “magical” device was mentioned every second panel. Booths at the exhibition area showed protoypes of iPad applications, and CMS vendors stated that they are planning iPad support sooner then later. However, amazingly enough, most of the people I’ve talked with never saw the iPad or held it in their own hands. Most of their knowledge about the device derived from Apple’s announcement and blogs – not first hand impression. 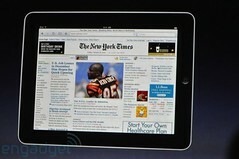 Based on iPhone and iPod success, iPad has the potential to become the magazine industry’s savior. However, magazines could not rely on single device or concept to be the answer of all their woes. Want to know what P&G told publishers about their future? check out this post. Last week I was invited to speak at Digital Innovation Summit in Berlin, organized by VDZ, the German Magazine Publishing association. In this series of posts I’ll cover some of the topics discussed. Susanne Kunz, media and communications director, Procter & Gamble, Germany, spoke at Digital innovators summit in Berlin last week, and had some very direct words to say to publishers. She stressed the fact that magazines are facing competition for ad money – and they aren’t necessarily delivering premium value. First she explained that magazine publishers in Germany are missing the most important value they could provide – customer insight. Publishers are not investing enough in knowing their customers and provide valuable information to advertiser. Second, she believed that companies and brands should be present on all platforms, cause their customers are on every platform too. Third, she stressed the fact that with content becoming more and more open and free, magazines should focus on bringing truly unique content to customers. And last but not least, she mentioned mobile as more than a content distribution platform – but also could be used for virtual goods and product delivery. Apple doesn’t like Flash. We know that already. Steve Jobs recently called Adobe lazy, and we all know that iPhone and iPad doesn’t support Flash. But the story is a bit more complex than that. By not putting Flash on the iPhone, iPod touch and iPad, Apple is creating a significant installed base of affluent users who simply can’t be reached via proprietary binaries like Flash and Silverlight. That has successfully shifted attention both to Apple’s own App Store platform for mobile apps and to the open web, encouraging developers to embrace standards-based rich web apps and multimedia delivery based on open specifications. Yesterday, I quoted this post on my Facebook profile, stating that Apple are promoting open web standards, by supporting HTML 5 over Flash. This created an interesting thread of responses, that you can see here. So 2009 ended, and we’ve thought it’s about time to do some facelift to this blog. What’s your opinion? Better or worse than the previous one? I am very excited today. Channel 2 News, Israel’s biggest news company, just launched its iPhone application, developed by Pravda Media. The application allows viewers to watch videos, text news items, and weather reports. It also allows users to send images directly to Channel 2 News Desk, and report scoops and exclusive images. We’ve been working with Channel 2 News company, especially with Liran Dan, head of interactive, and Tom Sharon, iPhone project manager, on various digital projects, among them the integration of Twitter with TV shows and in their general workflow. We believe that media companies, as well as marketers, should reach their customers on every platform, network, mean and channel. We help our customers to achieve this goal with building the needed tools, strategies, and technologies. It was extremely exciting to work on this application. And it is only the first version. We are planning to release exciting new features soon.